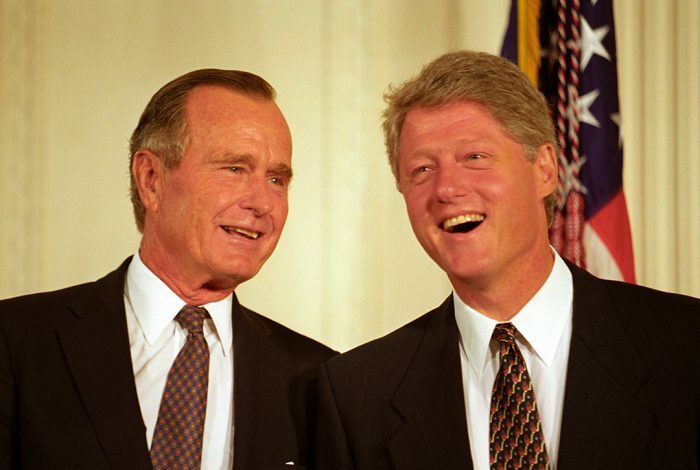 President Bill Clinton and Former President George H.W. Bush, September 14, 1993. Photo credit: Ralph Alswang / Wikimedia. History repeats itself, again and again. The idea of a US presidential candidate colluding with a foreign government to gain an edge on a political opponent is nothing new. Just ask former President George H.W. Bush, who was embarrassed toward the end of the 1992 presidential election by White House attempts to do just that. To get some dirt on Bush’s Democratic opponent, Bill Clinton, Bush loyalists in the US State Department began digging around in Clinton’s passport files. Meanwhile, the British Home Office was asked to search its own files for proof that Clinton sought British citizenship in order to avoid the Vietnam War draft while he was a student at Oxford in the 1960s. The purpose of the search, as Berry told investigators, was to find evidence of Clinton’s expressing “a desire to renounce his United States citizenship to avoid the draft.” No proof was ever discovered, and Bush and Clinton have since become the best of pals, collaborating on relief efforts for Hurricane Katrina and Asian tsunami victims. But long before the two developed their “father-son type relationship,” Clinton obviously had hard feelings over the action, and rebuffed British Prime Minister John Major for months. According to former British ambassador Christopher Meyer, despite the traditional “special relationship,” the two leaders did not work well together as a result of the passport fiasco. In an ironic twist, after Clinton became president, he was personally involved in attempting to influence the Russian re-election of Boris Yeltsin in 1996. He was even given the codename “Governor of California” for the operation. An American team went so far as to script a Clinton summit meeting with Yeltsin, where the Russian leader lectured the American president about “Russia’s great-power prerogatives” as Clinton stood down and listened. If some of that “trickery and slickery” came home to roost in the form of Russian Facebook ads attacking Hillary Clinton during the 2016 election, perhaps she has her husband to thank.